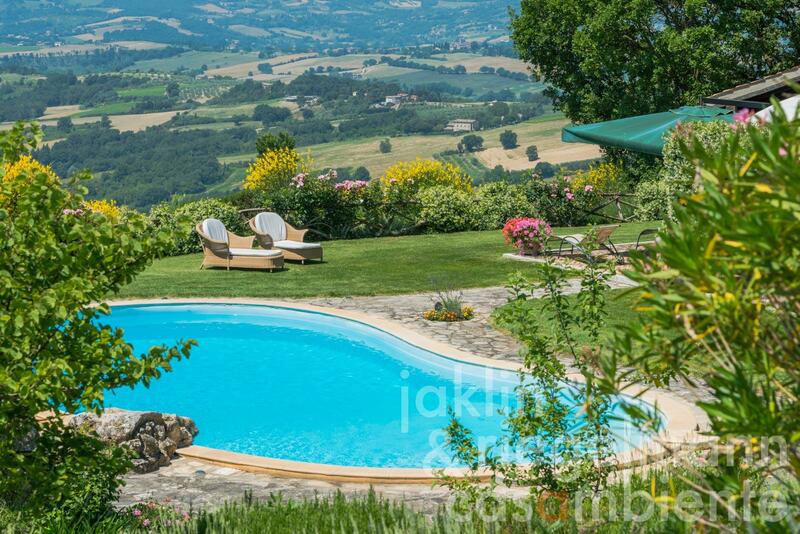 Special Italian villa with pool and spectacular panoramic views onto Todi and the surrounding Umbrian countryside. 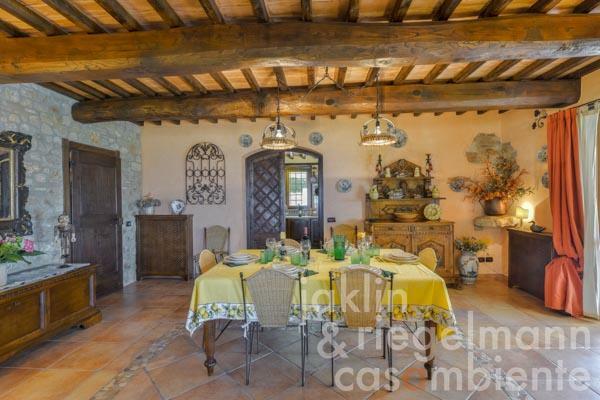 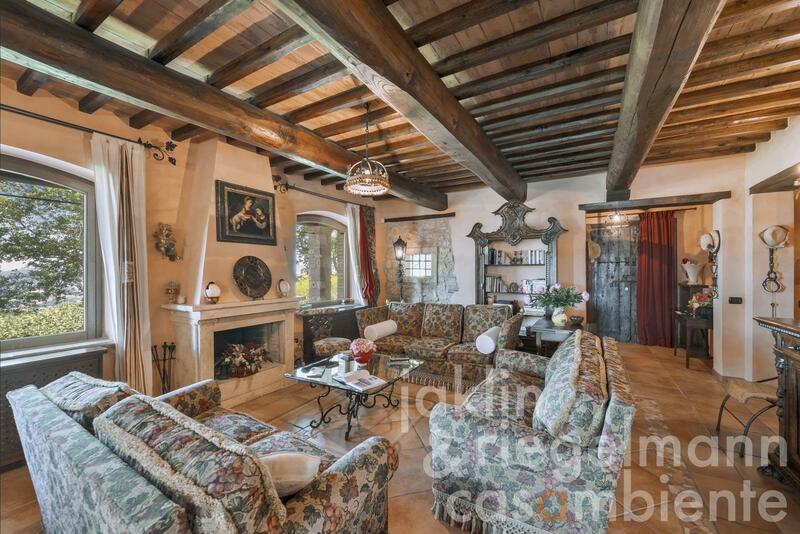 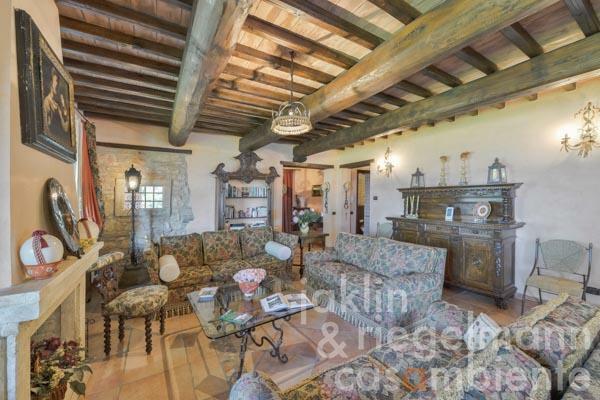 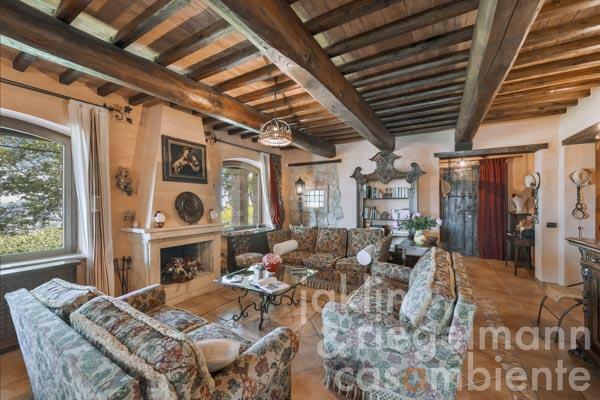 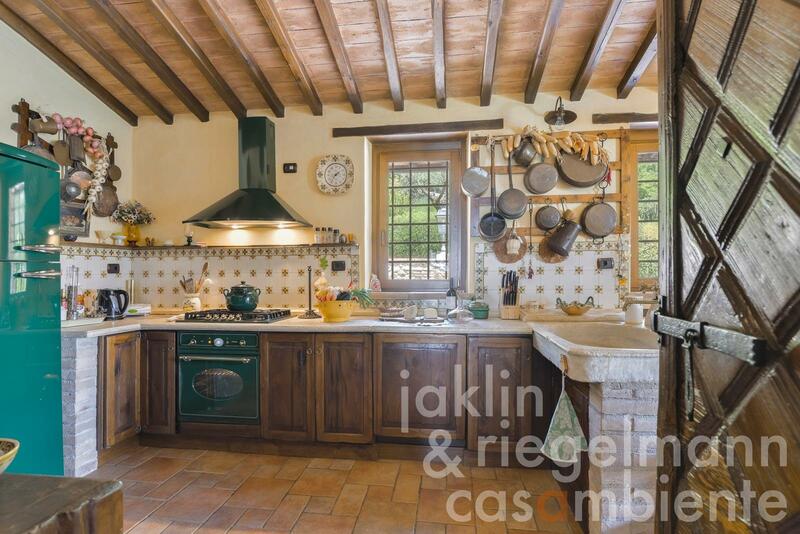 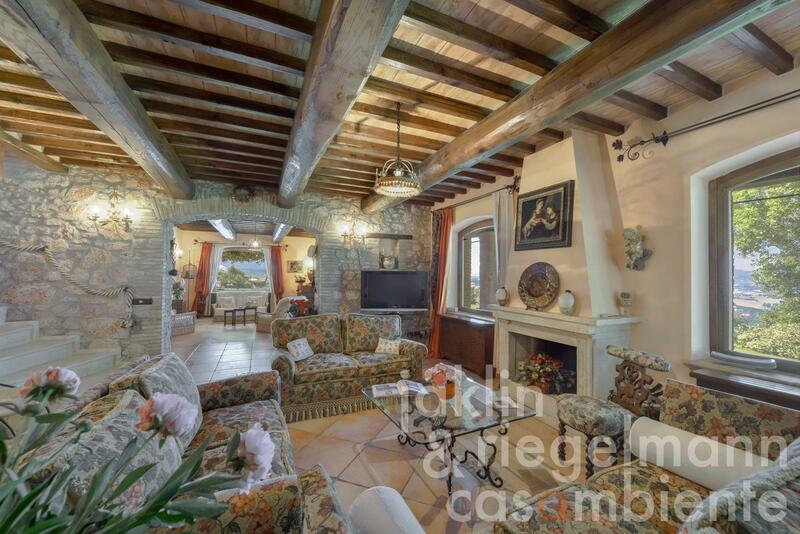 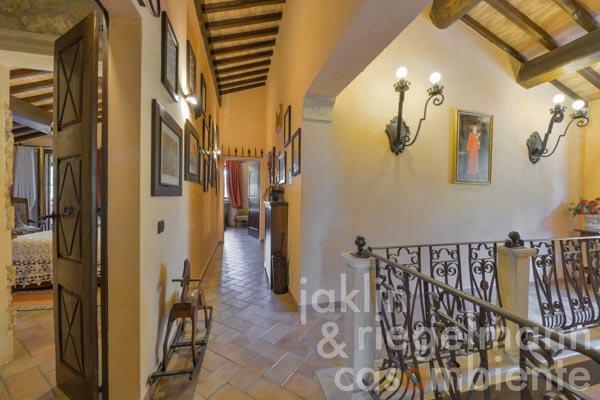 The property was rebuilt at the turn of the millennium in the traditional Umbrian architectural style and has traditional wooden beams, handcrafted terracotta floors, old doors and many beautiful features of classic Italian farmhouses. 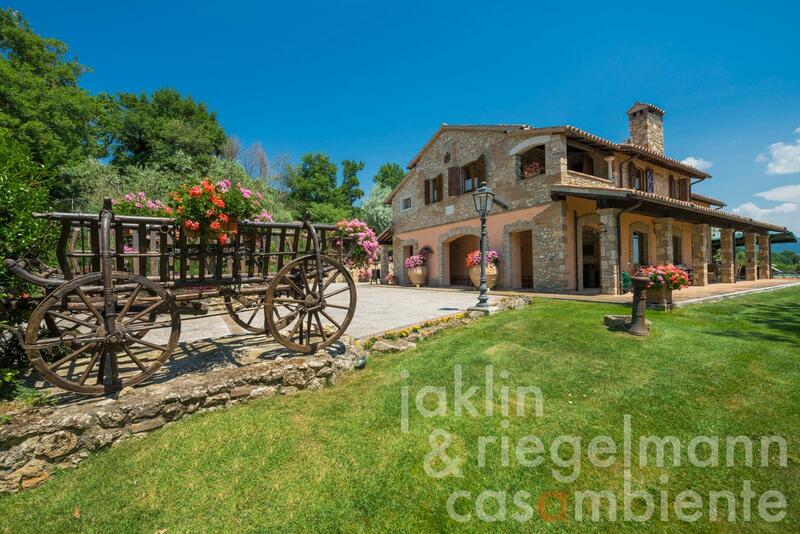 A paved driveway leads to the villa and to the parking area with carport. 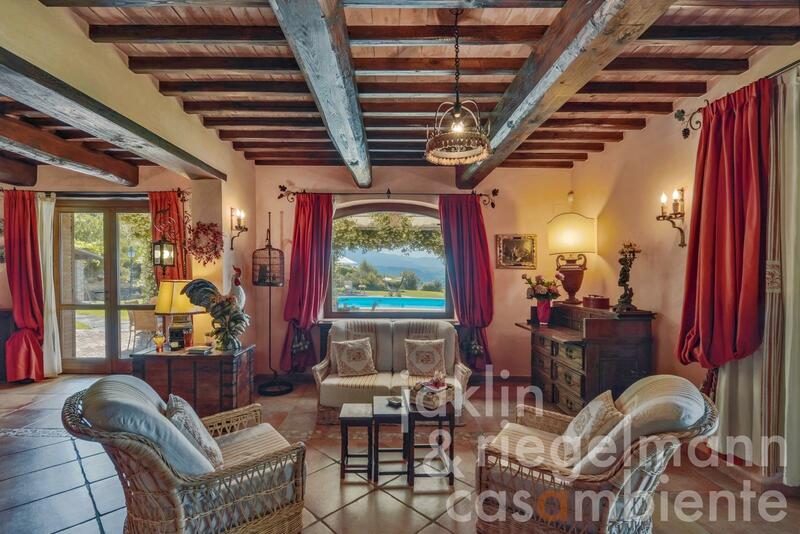 The villa is surrounded by a fully fenced and well maintained Mediterranean garden with a small olive grove, cypresses, oleanders and fruit trees. 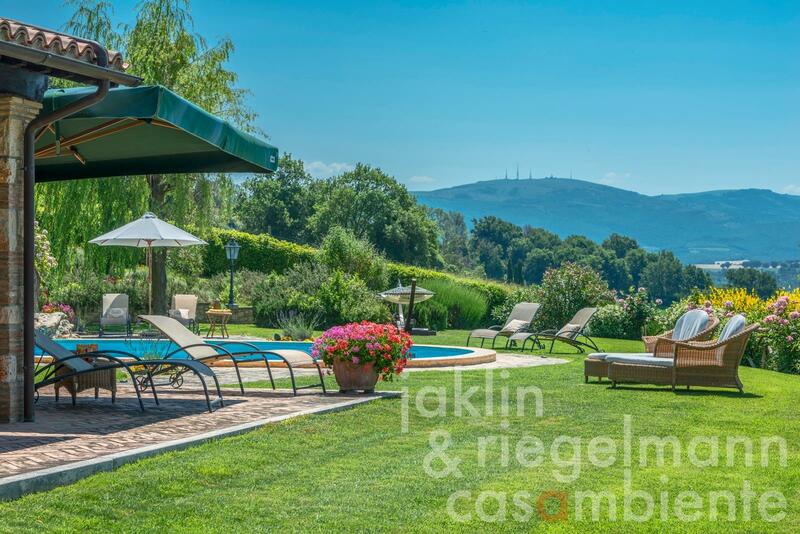 Several terraces invite you for an aperitif and dinner al fresco. 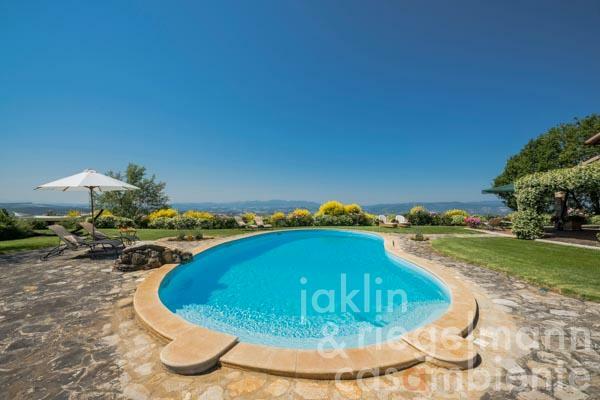 The view from the garden and pool is fantastic! The villa has two floors with a total area of approx. 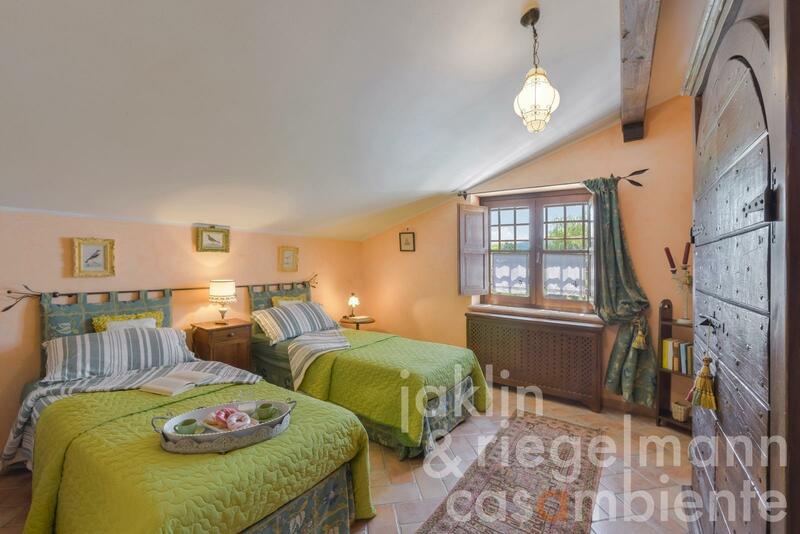 340 mÂ². 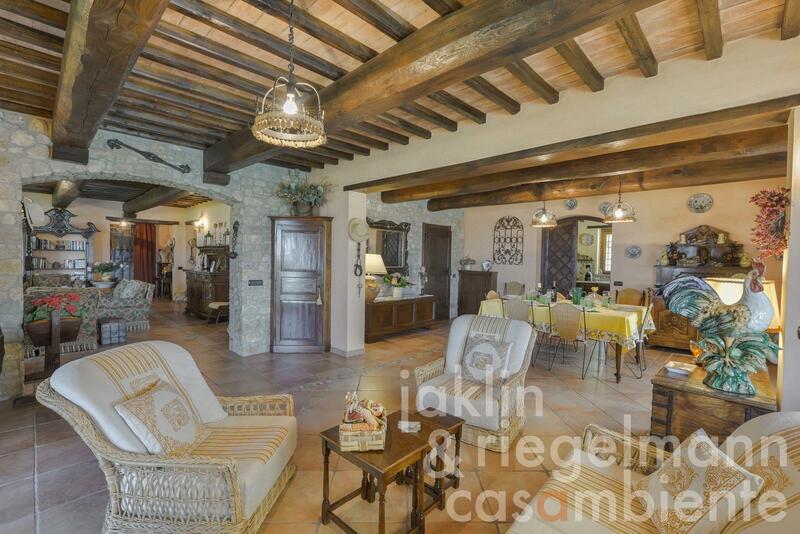 The ground floor consists of an entrance area with wardrobe, a spacious L-shaped living room with ample dining area and comfortable lounge with fireplace with access to the covered terraces, a fully equipped kitchen with travertine tops and pantry, a bedroom, bathroom and a storage room. 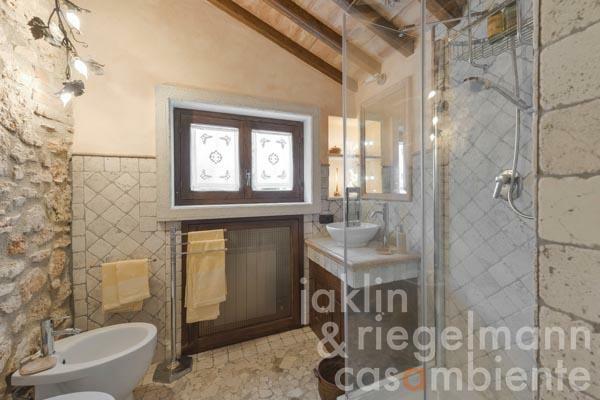 Another bathroom with shower and toilet is accessible from the outside and serves the pool area. 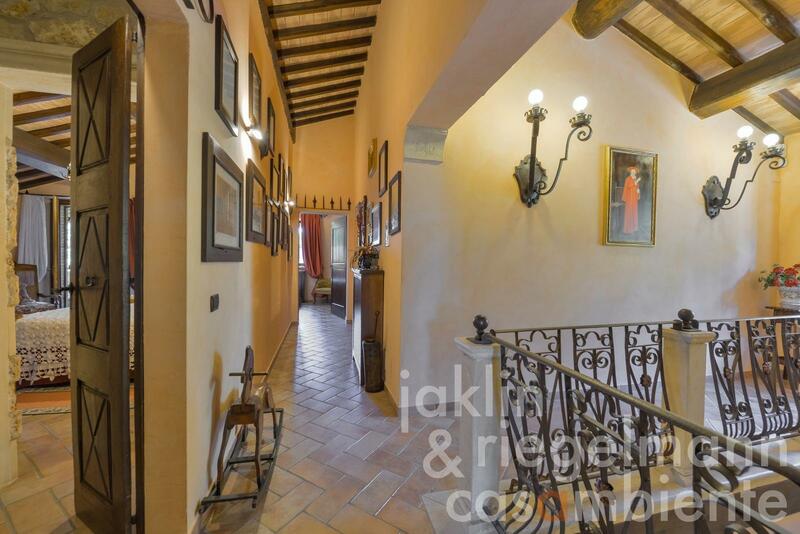 The upper floor is accessible via an internal travertine staircase and has four bedrooms with en-suite bathrooms. 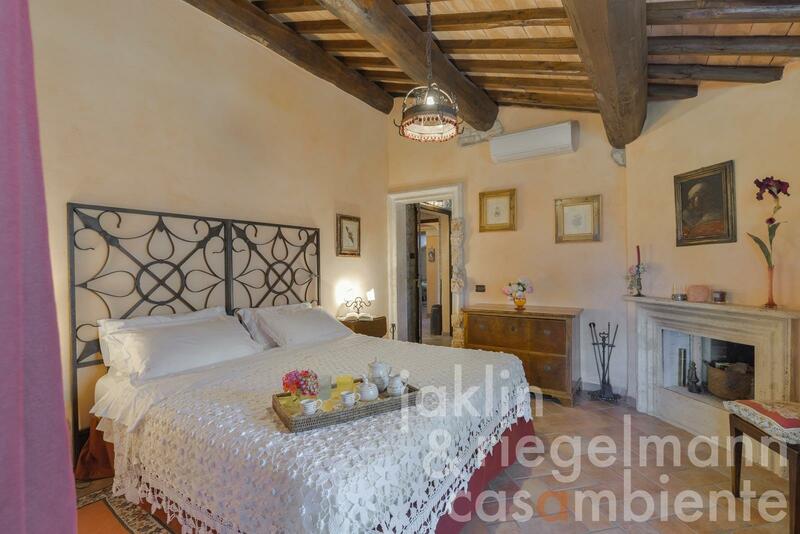 A master suite with private bathroom, walk-in wardrobe and private loggia completes this level. The location of the property is excellent, quiet but not isolated, and only about 750 m from the nearest village with shopping facilities and an excellent restaurant. 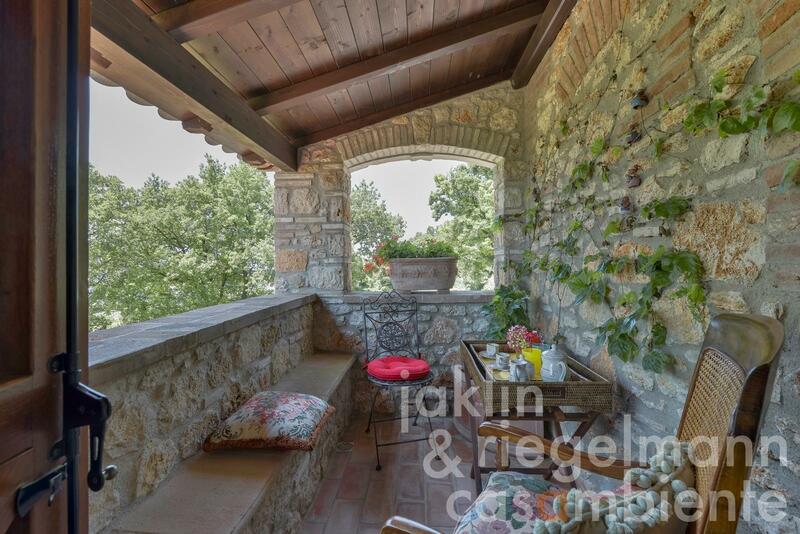 Todi is about 9 km away and has all shopping facilities. 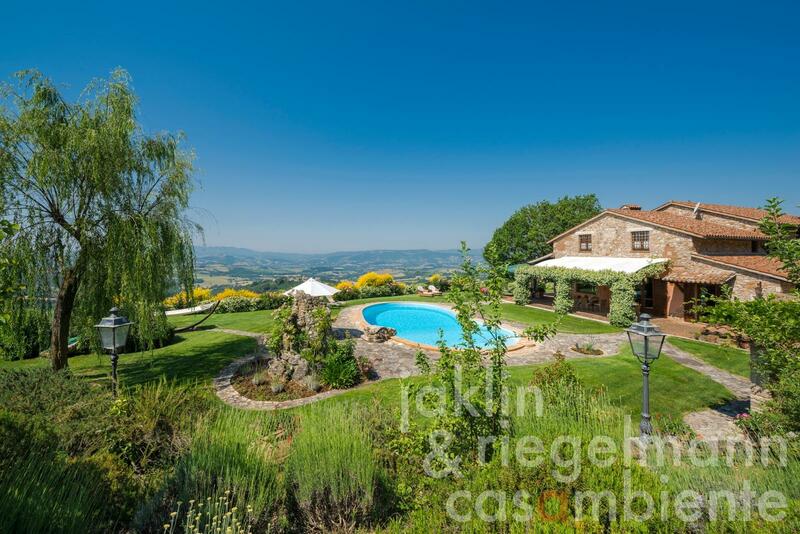 Famous places and cities in the surrounding area such as Montefalco, Spoleto, Perugia and Assisi are within easy reach. 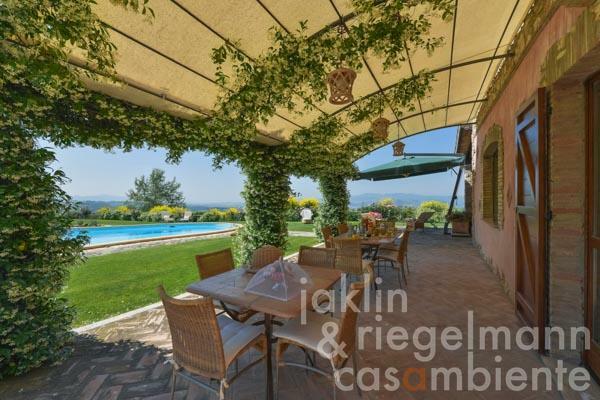 The airport of Perugia with regular flights to London Stansted, Brussels South and Frankfurt can be reached in approx. 45 minutes. Distances: Shop and restaurant 750 m, Todi (all shopping facilities) 9 km, Montefalco, Bevagna 20 km, Spoleto, Assisi 35 km, Perugia, Orvieto 45 km, Lake Trasimeno 50 km, Cortona 90 km, Rome 135 km. Airports: Perugia 45 km, Ancona 150 km, Rome 170 km, Florence 210 km. 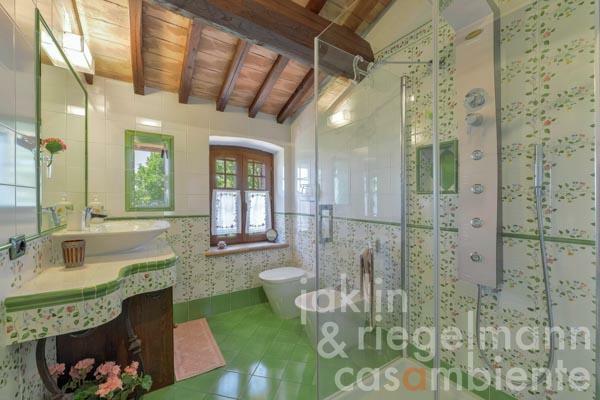 Italy, region Umbria, province Perugia, municipality Todi. 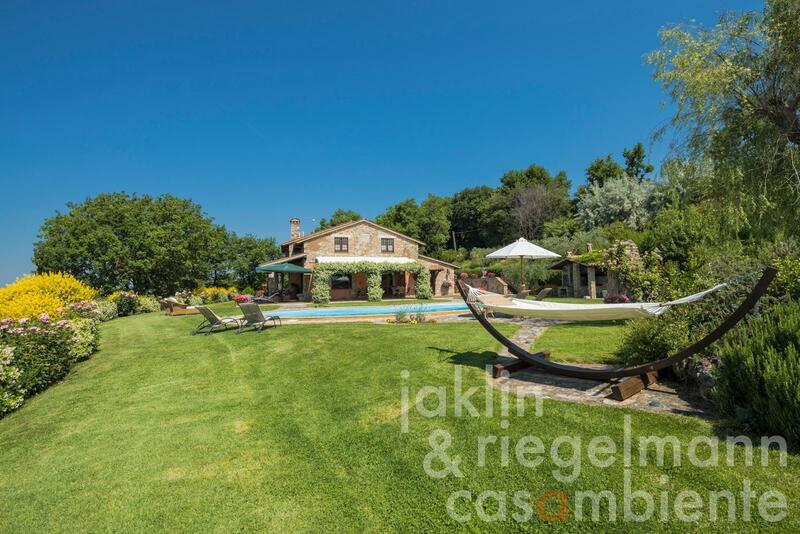 8,445 m² fully fenced and well maintained Mediterranean garden. 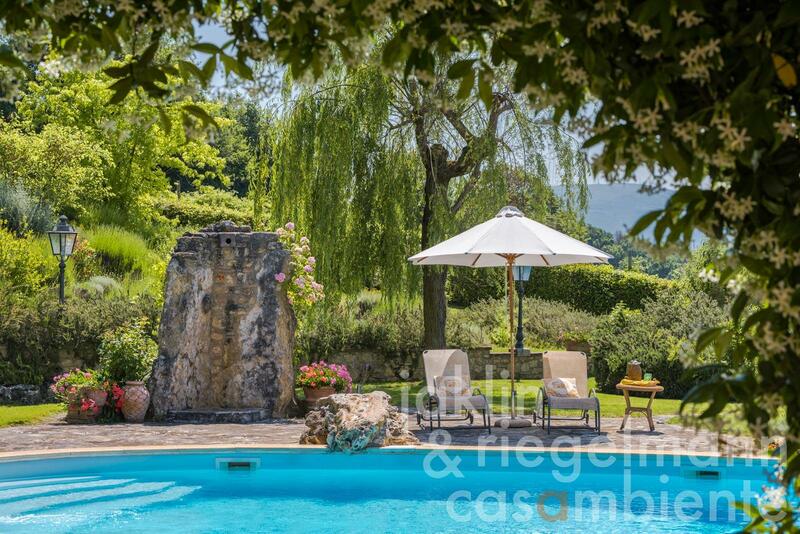 Electricity, mains water, own well water, central heating, fireplace, air conditioning, broadband internet access, satellite-TV, automatic gate, alarm system, irrigation system, swimming pool, carport, private parking, terrace, garden. Energy source: electricity, natural gas.